The weather can get scary. Reporting on it doesn't have to be. Climate change is a profoundly important topic that's worth almost every ounce of coverage it gets. Understandably, the discussion about how to deal with the problems posed by climate change and solutions to curb these dangerous effects takes up the majority of atmospheric news coverage these days, but most of this comes at the expense of talking about the weather. The hesitation of journalists and bloggers to cover the weather on its own merits is a serious disservice to their readers and our society as a whole. Climate change matters, but the weather matters, too. It's a big internet out there. News websites and popular blogs can talk about climate change robustly without sacrificing coverage of the most basic elements that affect us all on a daily basis. Just about any coverage of the weather in recent years has been pared down to a matter-of-fact recounting of some disaster that just happened and, even then, simply using the bad weather as a clunky segue to talk about climate. A barebones ten-day weather forecast regurgitated from the models by some random app on your phone isn't enough to understand and appreciate the weather. There's been a noticeable erosion of weather literacy in recent years. Meteorologists, bloggers, and amateur weather geeks alike will tell you that people seem to be having a harder time understanding the complexities of weather forecasts as time wears on. Uncertainty? Nothing doing! Tell me exactly what will happen. Nuance? No such thing. It takes more than a two-minute hit on the local news or an "89/72 ISO TSTORMS" blurb on your phone to understand what's going on when things start to go downhill. There is so much more to the weather than fodder for small talk—even the calmest day of blue skies and bright sunshine is exciting if you look just beneath the surface. A couple of years ago, I had the good fortune of teaming up with Outdoor Life to write a book about how to survive the weather. Survival books are a dime a dozen, but our book stands out from the rest because it not only teaches you how to survive the elements, but it also gives you the opportunity to learn about the elements. Knowing where to go, what to do, and how to react is vital for surviving a disaster, but your odds of survival are greater if you understand the forces of nature you're up against. Knowledge is power. You'd be surprised how many people know exactly what to do when a tornado threatens them, but have no idea how to read the forecasts or warnings that tell them tornadoes are on the way. That's our fault. We need to do a better job talking about the weather in a way that clicks and sticks around long after someone closes the tab. When I started brainstorming a snappy (or sappy) introduction to the book, the theme I kept circling back to in my mind was how every part of our lives is inextricably linked to the weather. It dictates our plans, what we wear, how we travel, what we eat, and even our fates. It's such a part of our being that our default small talk—the way we connect with people we don't know—is to talk about the weather. But the weather really is so much more than just small talk. There is a vast untapped audience out there for weather coverage that goes beyond click-grabbing storms that cause death and destruction. People are thirsty for the stuff. Trust me. I've been writing about the weather for what seems like an eternity in internet years. I started seriously covering the weather at DailyKos, a political blog, in the early 2010s; my weather posts shot to the top of the site's "recommended list" on a regular basis, even when the political world was in shambles. For a couple of years I ran The Vane, a weather vertical that was a part of Gawker. The blog saw 250,000 to 500,000+ readers every month, an impressive number for a deeply geeky and technical science blog housed on a gossipy news and opinion website. There are people who run blogs and social media accounts who make bank because so many people are interested in what they have to say about storms on the horizon. Heck, just one out-of-context screenshot from a weather model can get a million views on Facebook in a few hours. Readers want climate coverage, but they want to read about the weather, too. There's an audience for both and they're not mutually exclusive. There are just as many people who want to read about sea level rise as those who want to learn about why some derecho formed or how a thunderstorm parked itself over one town and dropped a foot of rain in a few hours. I can at least sympathize with the hesitation to cover the weather on its own merits. Some editors and writers I've spoken with over the past couple of years are worried about catching hell from single-issue activists ready to put them on blast for talking about the atmosphere without quickly pivoting to climate. Some of these folks view weather talk as an implicit denial of climate change; if you write an article about a tornado outbreak, for example, and don't devote a significant portion of it to climate change, your last name might as well be Koch. I get it. I've heard it. I've gotten plenty of hate mail over it. Single-issue activists do what they do no matter what the topic—they want to see their issue covered 100% of the time, and they'll shame and pester people who aren't talking about it until they are. If anything, demystifying the weather may help people better understand climate issues. How do we get people to appreciate the threats posed by climate change over decades if we struggle to get them to appreciate the threat posed by a storm in a few hours? Warnings for severe thunderstorms, tornadoes, and flash floods routinely go ignored until the worst happens, and then inevitably there's someone affected by the disaster who clamors to know why it happened without warning. A 20-mile difference in the track of a low-pressure system can mean the difference between a historic blizzard and a light dusting. A town could see a flash flood on a day the forecast calls for isolated thunderstorms. Helping readers understand what to make of and how to deal with threats in the short term will help them appreciate what's at stake in the long term. There's so much uncertainty and nuance to the weather that it takes more than a blurb on an app to understand it all. It takes dedicated, widespread writing and reporting, and it's something that's severely lacking today. The Weather Channel's website is getting better about writing about the weather in a personable, affable way that helps readers relate to what's going on right now. The Washington Post's Capital Weather Gang has been doing the same for more than a decade. I've found great success with my audiences taking complex weather events and boiling them down into fun, informative articles. The most satisfying feedback is when someone emails me to say that they were never interested in the weather before they read one of my articles, or that something that I wrote helped them understand a weather phenomenon or prepare for something that was on the way. If you're an editor in charge of making decisions about how your site covers the world around us, please remember that the weather matters, too. It's always a gamble to venture into a new field, but if you do it right and strike the right tone, it will pay off. If you're a reader who would like to see more weather coverage, search out the editors in charge of your favorite websites and implore them to cover the weather. If enough people reach out, they'll listen! There is nothing else on Earth that affects every single person so deeply and wholly as the weather. It deserves more attention than it gets. 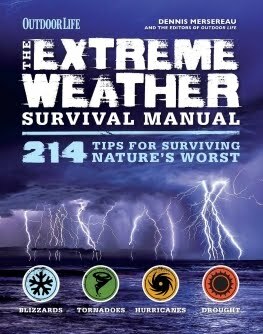 I teamed up with the editors of Outdoor Life magazine to write The Extreme Weather Survival Manual, your guide to surviving and thriving in almost any weather condition. Whether you're an avid outdoorsperson or you enjoy watching the radar from the comfort of your home, you're sure to find helpful tips, advice, and new bits of knowledge in this fascinating book. You can buy my book today through Amazon. Solid, engaging weather coverage without any of the hype of those big weather outlets that think of you as just another click. AccuWeather, Man, What Are You Doing?